by Pikkdogs ~ November 27th, 2011. A big hello to all you OHKOers out there. This is Pikkdogs here with a deck analysis for you. I am also joined by my extra-dimensionary sidekick, Pedro. I had a hard time trying to decide if this should be a stupid deck idea or a regular deck analysis. I did try the deck, and it does work, but it does not work all that well. So I’m not sure if I got everything that this deck offers, or if there is more that can be sucked from this deck idea. I will let you guys decide for yourself. So, Regionals and Battle Roads are all over and Cities are well under way. Football is winding down and basketball is starting up. It seems that Fall has worked its way into Winter. Yes it seems to be a pattern. Do you like the Winter Pedro? Oh Hell Yeah! Love the winter. What’s your favorite part about winter? How come every time I ask you about something the conversation ends up being about you wanting to fight with people? Well I guess I’m just a confrontational person. You know my dad is Mogor the conqueror. Sure, in my dimension he is like the Alexander the Great of the Quadrant. I guess I get my aggressive side from him. That would make sense. Let’s get onto the article, we can talk about your father another day. I like to call the deck we will be talking about today TCE, for Terrakion, Cobalion, and Electrode Prime. The strategy of this deck is easy. Noble Victories brought us a lot of good high HP Pokemon that have steep energy costs (kind of reminds me of early SP Pokemon). What we want to do is get these Pokemon going turn 2 with a lot of energy on them. Then we will be able to easily do a lot of damage. There are two main attackers in this deck. The first main attacker is Cobalion. 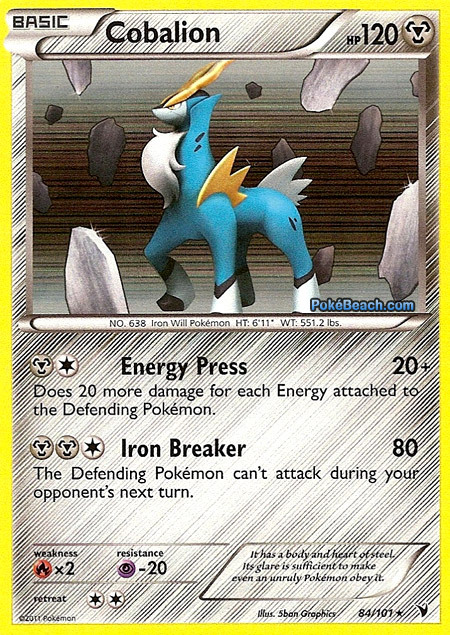 The deck tries to use his “Iron Breaker” attack to do 80 damage and cause the defending Pokemon to be unable to attack next turn. It should be easy to do 80 damage and knock out a Pokemon on two hits without taking a hit. Then you can take advantage of Special Metal Energies and Eviolite to make sure Cobalion can survive a hit. After another “Iron Breaker” you should be able to knock out the second Pokemon. This should give you the advantage in the game. Also, since it is a metal Pokemon it can hit Kyurem, Vanillux, and Beartic for weakness. Cobalion is probably the attacker you would want to use in most matches. 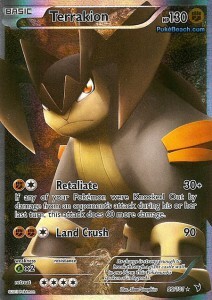 The second attacker in this deck is Terrakion. Terrakion has a high 130 HP and can hit for 90 for three energies. While 90 isn’t a great number, it does have type advantage over the most popular deck, Zekrom. It also can take advantage of Eviolite to stick around for a while. Terrakion may not be the best Pokemon around, but 90 damage, 130 HP, and weakness over Magnezone Prime and Zekrom makes him a pretty good Pokemon. The third piece of the puzzle is Electrode Prime. Electrode has the “Energy Mite” Poke-Power that will let you attach any energy card from the top 7 cards of your deck to any of your Pokemon. The drawback being that Electrode Prime is now knocked out, and any of the top 7 cards that weren’t energies get discarded. While you never like giving up a prize, it is the only way to get Terrakion and Cobalion powered up so quickly. The deck will not work without some form of energy acceleration and right now all we got that fits this deck is Electrode. So while we aren’t happy that we have to use Electrode Prime, it really is the glue that holds this deck together. I have seen people talk about this deck with Kyurem in the place of Terrakion. Personally, I prefer Terrakion over Kyurem in this deck, but my feelings could betray me (can you tell that I’m writing this article why watching Star Wars?). You should be able to switch Terrakion for Kyurem and the fighting energies for water energies in the decklist without any other changes. You are going to start with ether Voltorb, Terrakion, or Cobalion. It doesn’t really matter which one it is, unless you know what deck you are going against. On your first turn you are going to want to use a Pokemon Collector to get 2 Voltors in play, hopefully you will also get at least 2 attackers on the field. On your second turn you are going to evolve into Electrode Prime, then use all of your Research Records to put all non energy cards on the bottom of your deck. You can then use “Energy Mite” to power up one or two of your attackers. This move will allow you to use Twins if you wish. Then you can start attacking. TCE is kind of like a tool box deck similar to Stage 1 Rush. You can mold the deck and form it to fit your meta-game by adding in any number of the many Big Basic Pokemon (BBP). So it is hard to set matchups when you can easily change the deck. 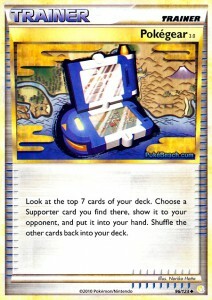 But we will assume you are using the Terrakion and Cobalion version fo the deck. We will also assume that you will be able to improve on the decklist that I will eventually give you guys, and make the list a little more consistent with a better late game. Zekrom– even. The high HP of your Pokemon will make them very hard to donk. While it is true that you might get stuck having to attack with Cobalion, if you can get Terrakion going they will have a hard time responding. Good Zekrom players might be able to out play you, but you do have a good shot at winning if you can keep your deck consistent. Primetime-Favorable. This deck is similar to Zekrom except that Yanmega is not as much of a threat has Tornadus is. Yanmega does have the free retreat that Cobalion hates, but you should be able to control the game with only Terrakion. Gothitelle/Truth– slightly unfavorable. You will setup faster and hit really hard right away. However, if they can stop your momementum they should easily be able to control the game. So it just depends on their setup. Donphan/Dragons– slightly favorable- Terrakion will probably match up well with Donphan with an Eviolite. Throw in some help with Cobalion and you should be okay. Reshiram– Unfavorable. Cobalion will be of no help here because of the weakness. Terrakion will be able to hold its own, but with no weakness 90 damage doesn’t cut it. So if you can get a consistent list, the matchups are not that bad. The hard part will just be to get your list polished up so it works all the time. That gives us a good segway to the part of the article where we talk about the decklist. I will admit that I have a very poor decklist of this deck. It is in no way ready for a tournament. I am still trying to make room for necessary cards like Junk Arm. This deck has to be very focused on getting a turn 2 Electrode. 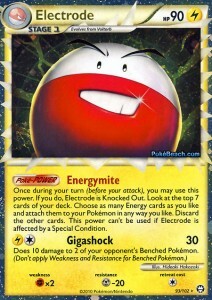 If it is not focused on Electrode the deck will never work. However, getting your deck focused so much on turn 2, will not leave a lot of room for trainers that will help you later game. So the balance in building this deck has to be kept. I will give you a list similar to the one I tested with, and although it is not a good list, it is something that you might be able to work with. So there is my list and a run down of the deck. The list does need some work before I am convinced that this a great deck, but it does have some potential. This list doesn’t even have Junk Arm in it, you probably are going to need to fit that in somewhere. So if you have some time, you can test with this list to see if the deck is any good. Well that’s all I can say about this deck. What you got for us to end the article Pedro? In this day in history in 1942 Jimi Hendrix was born. Do you like the Jimi Hendrix Pikkdogs? Love the Jimi Hendrix. 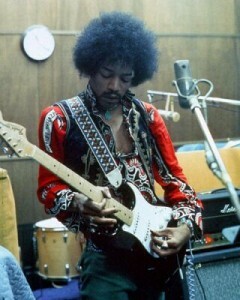 I don’t know which song I like better, “Hey Joe” or “Foxy Lady.” I do enjoy the Jimi Hendrix. I actually have a Jimi Hendrix story. But he died like 15 years before you were born? Well I have a story about someone named James Hendrix. A couple towns over from where I grew up there was a guy named James Hendrix, and we always used to call him up and ask for “Jimi Hendrix”, then we would giggle and hang up. That was not a funny story at all Pikkdogs. No, I guess it wasn’t. Kind of anti-climactic. But, I guess it will fit right in with all the other un funny stuff. Have a good night everybody!